Some see Timothy Michaels perform LIVE with the Doobie Brothers and America tribute band “American Minute”. 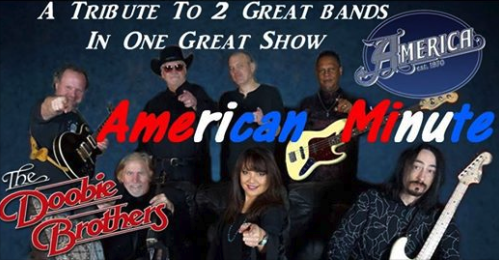 “American Minute” will be performing Saturday, March 9th from 8pm – 11pm at the Emerald Downs Racetrack and Casino (2300 Ron Crockett Dr NW, Auburn, Washington 98001: Free admission, smoke free, and free parking). You can find more information at the facebook event page. Performing a private party June 14th. Timothy Michaels is an accomplished musician and composer, proficient in guitar, pedal steel guitar, violin, bass guitar, flute, and drums. He has won awards for vocals and has been professionally writing and composing beautiful, melodic compositions for more than thirty years. His instrumental music embodies emotion and energy, integrating influences from jazz, folk, and rock. Audiences have delighted in his diverse performance style for more than twenty years and Timothy has provided music for the Fox radio network and has appeared on KONG TV. His latest release, Dancing Waters, is soon to be available on this site. Timothy is a seasoned, professional musician and is available for bookings and special engagements, as well as private music instruction. Hear more on the Listen page.